I’m a lucky girl who has a lot to be thankful for. not to mention things like chocolate, wine and margaritas. and I’m a big believer in making memories and what better remembrance of all those family Thanksgiving dinners than a Thankful Pumpkin that I can gaze at lovingly when I’m an 87 year old woman in a rocking chair. So I’m starting one of my own new Thanksgiving traditions this year. and Olivia is thankful for candy and trips to the mall. Buy a funkin – aka, a fake pumpkin! 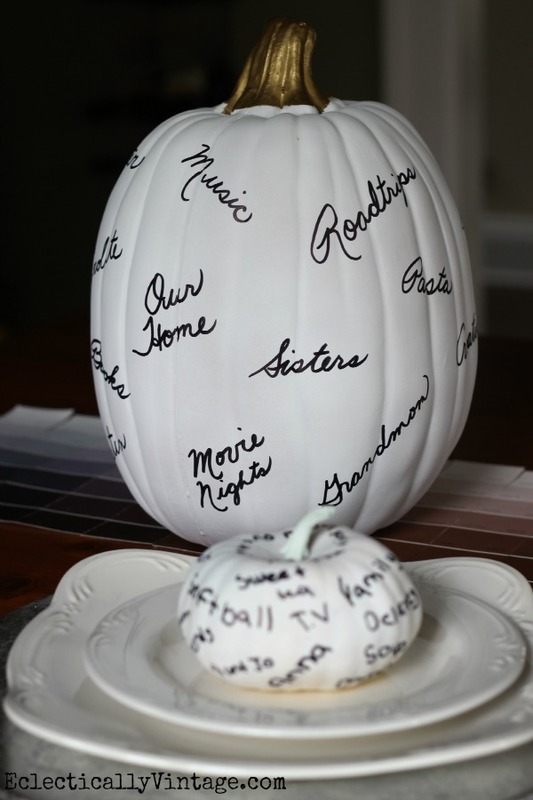 So set out a big pumpkin – real or funkin – centerpiece and a mini at every place setting and let your guests tell you what they’re thankful for. These will look amazing with another tradition we started a few years ago – a fun Thanksgiving centerpiece that the kids can make while you’re cooking. I’m also thankful to have made the most amazing friendships with this talented group of gals. Want to see 24 other Thankful at Home ideas? Just click on the links below. What a cute idea! My girls are thankful for Taylor Swift and a little bling, too! Perfect project for the Thanksgiving table! Thanks for sharing! Sweet idea! I love that Maine is on a thankful pumpkin! I absolutely love this idea. I think we are going to try this for this year. I will then put them away and save them for when my granddaughter (2 yrs.) gets older and can see what we were thankful for through the years. I love those pumpkins! I just love the idea of writing what you are thankful for on them too!! Fabulous idea, and I just might have to steal this one. Happy Thanksgiving to you and your family Kelly. Lovely idea. I could see myself trying this with REAL pumpkins and then wondering what the smell was from the seasonal storage closet about mid December! 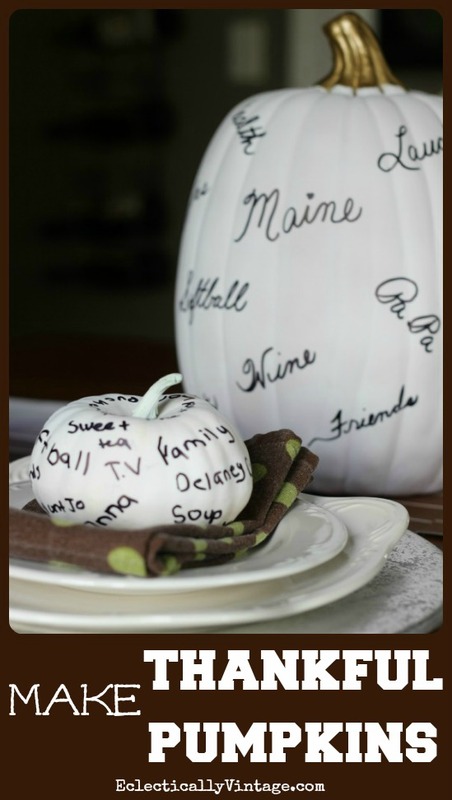 What kind of paint and pen do you use on the pumpkins? I love this! Have to do it with my kiddos. We say what we are thankful for every night in bed. This is a really cute idea Kelly. I think that is a great family tradition and a great way to give Thanks!! LOVE this idea! Simple and memorable. My family will love this. So happy to be apart of this series with you, Kelly! I’m so happy you’re a part of this tour and I’m thankful to have “met” you, too! 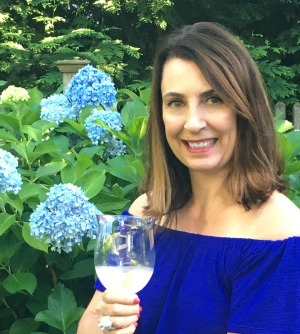 Oh you did it again…came up with a fabulously creative way to document our blessings and what we are so grateful for…love, love it…you are one creative woman!! !….Have a wonderful day Kelly!!! Thankful for your thankful pumpkins Kelly! What a fun and meaningful new tradition. I love it! Love this kelly! 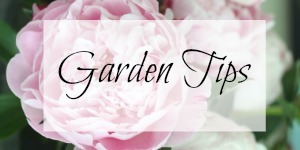 My kind of project, easy and sentimental and pretty! I usually just print out small tags and insert them in glass balls and add the year with glitter glue outside. So far, I’ve had 2 years of these ‘thankful” ornaments for our tree. Planning to do it again this year or maybe I just might ‘steal’ you pumpkin Idea! Seriously Kelly it does not get any cuter and thankful than that! How sweet my friend. Happy to be a part of this series with you. I love this idea Kelly! What a great tradition to start! Oh Kelly I LOVE this idea! 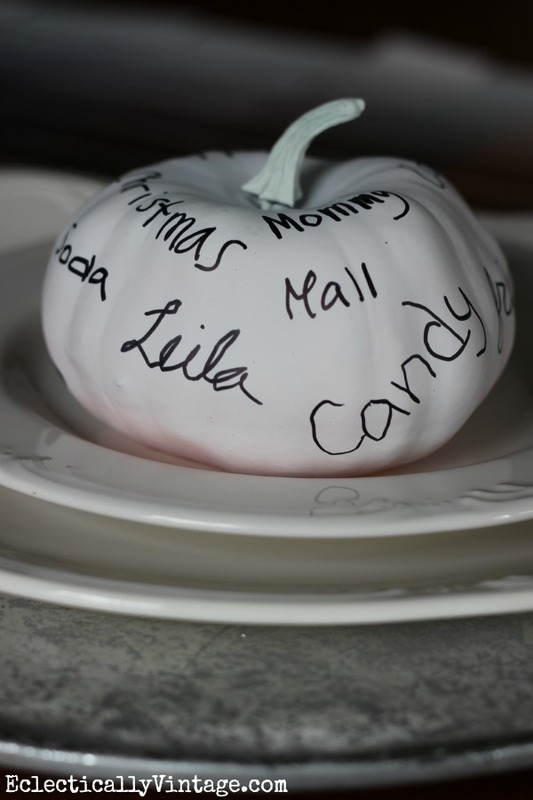 My girls pumpkin would read a lot like yours do…T.S., trips to the mall, candy & pasta. Too funny..r your girls 10 & 13 too? Thank you so much for being on this tour with us. 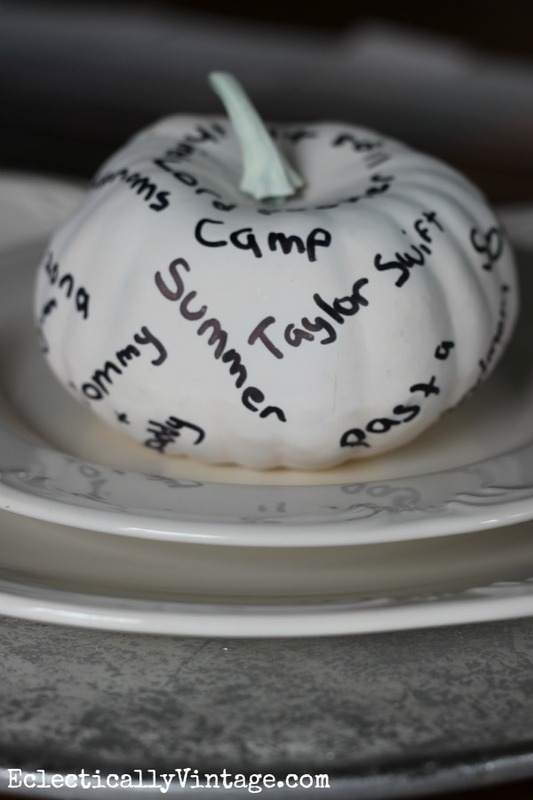 What a fun new tradition- glad you got a mention on the pumpkin lol-wonder if Taylor Swift will be replaced next year! mind. blown. love love LOOOOVE! Love it. If I hate the Dollar Tree fakes that I could paint and keep, I’ll go with the real deal, that unfortunately won’t. These are AWESOME Kelly!! 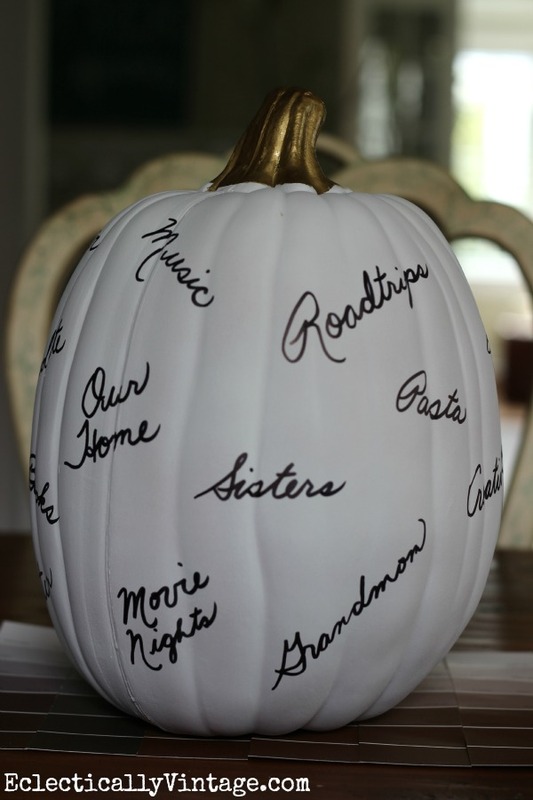 I love this idea and I have been trying to find more white pumpkins but HobLob was sold out as of two weeks back so I am going to need to just paint some! So glad to hve been a part of this tour with you! Pinning, of course. Have a great weekend! Kelly, this is such a wonderful and lovely idea! Thanks so much for sharing and hope you are having a fantastic weekend! Cute idea, Kelly! What a great way to look back and see all the wonderful things your are thankful for. Your pumpkins are extra special. I LOVE this idea! I’m going to have to remember this for Thanksgiving! it’s such a fun tradition Candy – enjoy!